Some of the best meals come from the most unexpected places. I first made a couscous like this as a dinner side. In typical fashion, I made a bit too much of it and into the fridge it went to become lunch leftovers. Or so I thought. The next morning I woke up, still craving that couscous. The magic of that couscous was it’s simplicity. It didn’t have too much, some herbs, salt, and some Kerrygold Garlic and Herb Butter. But those three ingredients were enough to make it just pop and stick in my mind. Sometimes things can get too complicated, and when we find something done simply and done well, it just stays with us. When breakfast rolled around, I decided to warm up the couscous and put a sunny side up egg on top. 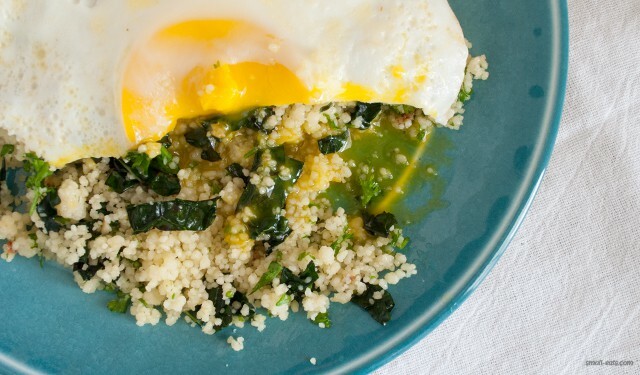 The power of a hot, runny yolk pulled this dinner couscous into the breakfast realm for me. The runny yolk mixes with the herbs and couscous wonderfully, and a warm breakfast at this time of year is an excellent breakfast. This recipe has kale added in to boost the veggie content and to give it some more texture. You can swap out the kale for spinach or chard, if you’d like. In a medium-sized bowl, add the couscous. Pour boiling water over it, just enough to cover the couscous. Allow couscous to sit for about ten minutes, then fluff with a fork. Cut your kale leaves into small, bite-sized strips, about 1/4" wide by 1/2" long. Bring a sauté pan to medium heat with a 1-2 teaspoons of olive oil. Once hot, add garlic and cook for 1-2 minutes. Add kale and stir for about 5 minutes. Remove from heat. Add herbs, kale, and melted Kerrygold herb butter to couscous. Stir to incorporate and add salt to taste. 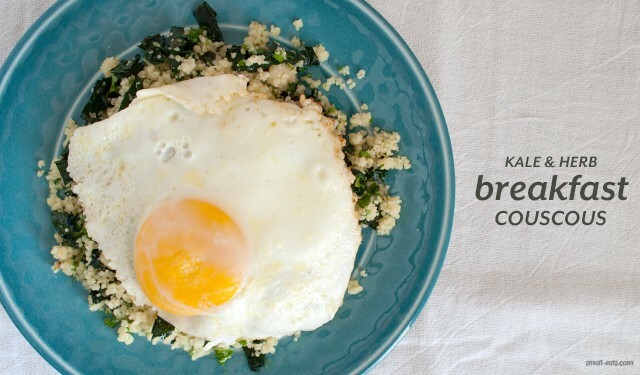 Put on a plate and top with a sunny side up egg. I’m all about the savory breakfast. In fact, I was JUST thinking about making some couscous to go with the shakshuka I made last night. I ended up going with yogurt (I know… lame), but now I’m totally inspired and, next time, I’ll listen to my instincts. Thanks Brian! Couscous sounds magical with shakshuka! I think I need to try that. Can’t wait to hear about your next savory breakfast! I love a fried egg on top of anything and everything! I also happen to heart Kerrygold Garlic and Herb Butter. I like it on gnocchi or simply spread on a cracker. Too bad my gluten sensitivity precludes me from enjoying couscous. Oh well!